Primitive Black Felt I'll be Back Again Someday Frosty's Top Hat Decoration. Great little accent piece for winter. 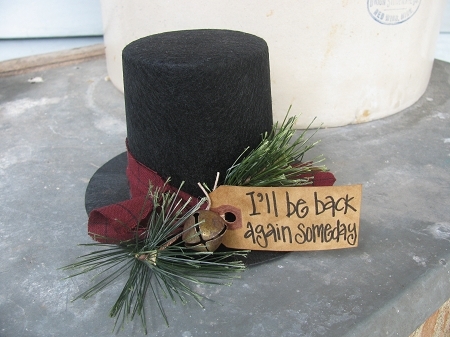 The hat is black stiffened felt that I've tied a burgundy homespun band on with smokey mountain pine greenery, a primitive tag that I wrote "I'll be back again someday" and accented it with a rusty jingle bell. A neat decoration to set out for the winter months. Size is 4" high by 5 1/2" wide. Some customers have shared with us how they used these besides as a decoration. One said, she took one of these hats, laid two twigs along side and a carrot nose. Made it look like he melted. The other took thread and attached a loop at the top and made it into an ornament for her tree. Either way you can't go wrong with this hand made item! Hand made and designed by Heidi.